In the wall of the glandular lobules, several end pieces drain into the same tertiary duct. The end pieces have a longitudinal tubular shape and consist of cuboidal to low columnar cells, depending on the activity of the cell. The nucleus of the glandular cells is spherical to ovoid, the cytoplasm contains a strongly stained grainy secretory material. These glandular cells produce both HCl and pepsinogeen thus combine the function of the parietal and chief cells in mammals. 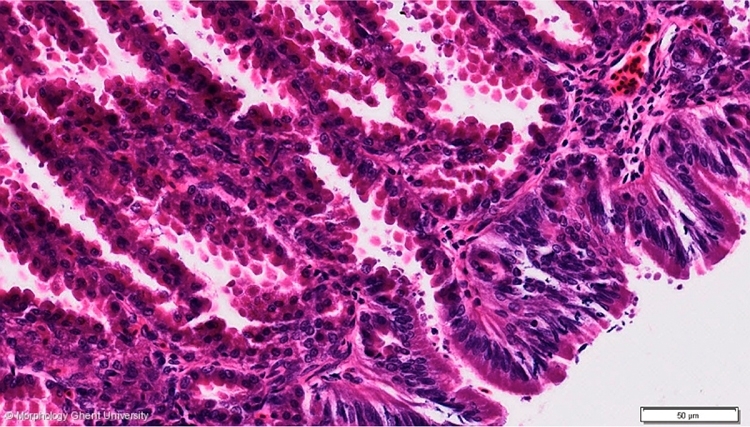 The lining epithelium of the secondary and tertiary ducts is also a simple columnar epithelium. The nuclei in this epithelium are ovoid.